Idril Abshir penned this interesting piece arguing that African entrepreneurs should talk about failure more, indicating that they will find resilience in discussing failure. She cites the culture among Western entrepreneurs of acknowledging failure. While the stories in the piece were compelling, I don’t know that the West’s approach to failure is the bar African entrepreneurs should try and attain. Silicon Valley has championed failure as a means for learning, though I believe it has enabled bad behavior as well. I hear too many stories of founders leaving investors high and dry due to not communicating the struggles they were having. Anyone remember Clinkle? Fab? Rothenburg Ventures? I also think African entrepreneurs have proven their resilience in the face of conditions of which American entrepreneurs have no concept. The IMF highlighted concern about African economies operating at two speeds, with some countries driving high growth levels and others serving as a drag on growth. The debt situation of countries like Mozambique is also concerning. These countries which raised a bunch of money on bond issuances several years ago are now struggling to handle them. It would be frustrating to see a bunch of defaults like Mozambique in the coming years. After shutting off the internet in the English speaking portion of Cameroon for 94 days, the government is hosting a conference on the digital economy promoting it’s efforts to be a global leader in that space. Seriously? Let’s work on not shutting of people’s internet connections, first. Last weekend, some friends and I hopped on a Google Hangout to discuss McKinsey Global Institute’s report on Nigeria’s inclusive growth prospects and what needs to happen for the country to realize that potential. 40 million Nigerians are in the consuming class, but 130 million live below the Empowerment Line – an indication of their ability to afford eight household essentials for a decent standard of living. GDP could reach $1.6 trillion by 2030. Investment in infrastructure could reach $1.5 trillion to support GDP growth and address road density being 1/7th and power generation 1/5th that of India. 1. Nigeria is growing in spite of the serious challenges it faces. We have seen the coverage of Boko Haram’s activity in the North and the 130+ days the government has still not rescued the girls kidnapped from their school. We have also seen the largest acquisition by a Nigerian company when Oando bought ConocoPhillips’ Nigeria oil assets for $1.65B. Nassim Talib’s theory of antifragility comes to mind – the notion of shocks, disorder, volatility driving gains. 2. The skills gap in the country was troubling. The report states that 1 out of 6 of the world’s out of school children between age 6 and 17 are in Nigeria – 10.5 million children. Just thinking about the world’s population, I would think there are more than 60 million children not in school within this age range. Nonetheless, think about all the latent potential in Nigeria. Furthermore, the report highlights the poor quality of education. After six years of school, one out of five Nigerians between the ages of 15 and 29 can read and write. 3. Urbanization in the country was another interesting part of the conversation. McKinsey’s insights on urbanization not having the same economic effects as in traditional models was quite interesting. We discussed the rise of financing tools to get more people into homes and the potential risk of tools like mortgage-backed securities. 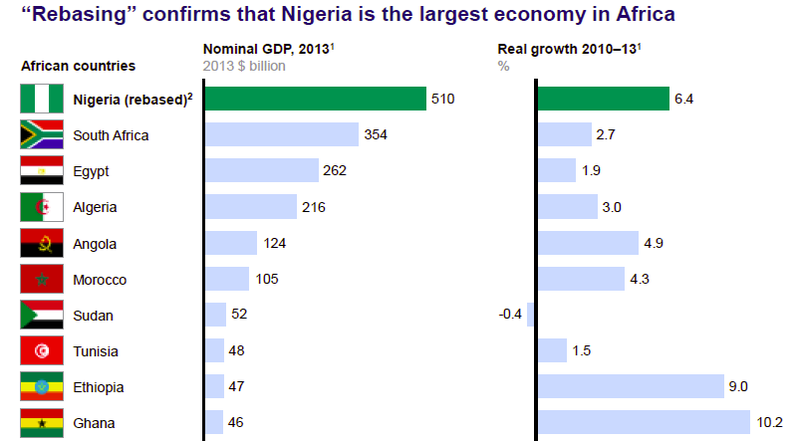 Nigeria’s growth potential is real, as are its risks. The report had a lot of information and I am interested in your insights. What are some other things that stood out for you in the McKinsey Global Institute report? Shoot me a tweet with your thoughts.